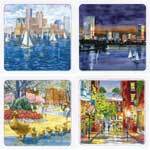 A single absorbent coaster with Townhouse Reflections Boston image by Boston watercolor artist Thomas Rebek. Coasterstone makes the most sophisticated and highest quality absorbent coaster on the market. Even on the hottest and stickiest summer days, these coasters, made from naturally absorbent sandstone, will soak up moisture from the wettest glass and protect your favorite family heirloom with their durable cork backing.